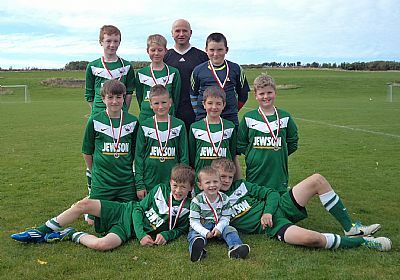 The final competition of the youth football summer season was played at Picky on Saturday 14th September as ten S1 & Under teams played for the R Clouston Cup and Plate. Despite a couple of heavy rain showers early on later conditions turned out favourable and spectators were treated to one of the most exciting and closely fought Clouston Cup competitions for years. The format saw teams play in two groups with the group winners and runners up progressing to the semi-finals of the R Clouston Cup and the third and fourth placed teams competing for the R Clouston Plate. In Group A Stromness A and Thorfinn A had a comfortable passage into the Cup semi-finals with the match between the two of them ending in a 1-1 draw. Group B was much more competitive affair with only 3 points separating the top 4 teams as they took points off each other. In the end it was Dounby A and East United A who squeezed through ahead of Thorfinn B who could consider themselves unlucky having remained unbeaten in their group matches. The semi finals proved to be closest of matches with nothing to choose between the teams and both having to go into extra time to decide the winner. East United A took a first minute lead but Stromness A equalised on the stroke of half time and with no further scoring the game went into added time. The other semi between Thorfinn A and Dounby A ended up goalless and also required extra time. In added time it was Stromness and Thorfinn both scoring the decisive goals that gave them both the narrowest of winning margins. The final itself was also the tightest of matches with Thorfinn taking the lead in the first half through Scott Taylor but Sam Hunter equalised for Stromness in the second half. There was plenty of action in extra time with Cameron Fraser in the Thorfinn goal producing two excellent saves including one from a Stromness penalty. Thorfinn themselves came close to scoring the winner at the death when an Aidan Robertson drive smashed against a post but with the teams level it was on to the dreaded shoot out. Stromness proved more deadly from the penalty spot out scoring Thorfinn 4-3. 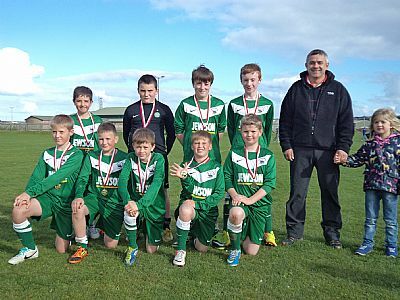 This was Stromness’s first victory in the competition since 2002 and ended three years of East United dominance. There was some consolation for Thorfinn when their B team secured the R Clouston Plate with a narrow 1-0 victory over East United B with Reid Kemp scoring the winner. At the end of the completion OYDG Chairman Stephen Crawford congratulated all the teams for providing excellent competition and thanked the sponsor, clubs, Picky groundstaff and coaches. Sponsor Bob Clouston then presented the medals and trophies to Stromness A and Thorfinn B. OYDG would also like to thank the referees for the day:- Ian Scott, Graeme Leask, Ivan Leslie and Alan Scott. Stromness A 1 Thorfinn A 1; Dounby B 1 East Utd C 0; Thorfinn C 0 Stromness A 6; Thorfinn A 5 Dounby B 0; East Utd C 0 Thorfinn C 2; Stromness A 9 Dounby B 0; Thorfinn A 7 East Utd C 0; Dounby B 1 Thorfinn C 1; East Utd C 1 Stromness A 5; Thorfinn C 0 Thorfinn A 5. East Utd A 0 Dounby A 1; Stromness B 0 Thorfinn B 1; East Utd B 0 East Utd A 3; Dounby A 2 Stromness B 0; Thorfinn B 1 East Utd B 1; East Utd A 4 Stromness B 0; Dounby A 0 Thorfinn B 0; Stromness B 1 East Utd B 3; Thorfinn B 1 East Utd A 1; East Utd B 1 Dounby A 1. Thorfinn C 1 East United B 2; Thorfinn B 4 Dounby B 1. 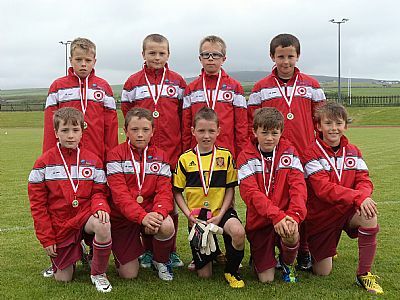 OYDG welcomed visiting Shetland sides Lerwick Rangers and Scalloway for the annual Under 12’s 7-a-side competition last weekend. Twelve teams played in two leagues with matches spread over the Saturday and Sunday. After an exciting Saturday which kicked off in damp conditions it was Scalloway A leading the A League with 9 points from Thorfinn A (7pts) and East Utd A (6pts). In the top match East Utd swept to an early 2-0 lead against Thorfinn. However the Kirkwall side produced an excellent comeback to draw level and although United took the lead again Thorfinn equalised to gain a valuable draw. This draw coupled with a defeat against Stromness proved costly for East. Scalloway had looked impressive in Saturday’s matches but they were unable to match Orkney’s finest in Sunday’s matches played in brilliant sunshine. Both East and Thorfinn secured victories against the Shetland club to knock them from pole position. With both Orkney teams winning their other matches it was Thorfinn who pipped East to the A League by a single point. The B league turned out to be even tighter and once again it was Thorfinn and East leading the pack. 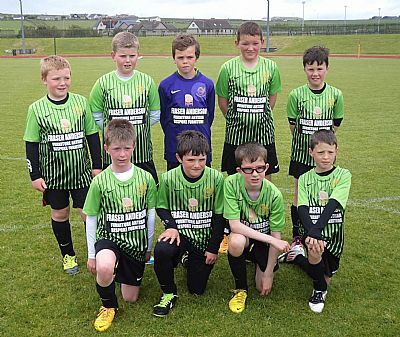 East Utd B and Thorfinn B won all of their matches on Saturday and faced each other in Sunday’s league decider. Thorfinn took the lead in the match and were unlucky not to add to their lead with a number of chances which East survived. Despite all their pressure it was East who found an equaliser after a penalty kick was well saved by the keeper. The ball was tipped onto the crossbar and East were quicker to seize on the rebound and hammer the ball home. With the game finishing all square and both teams ending on the same points the league was decided on goal difference. 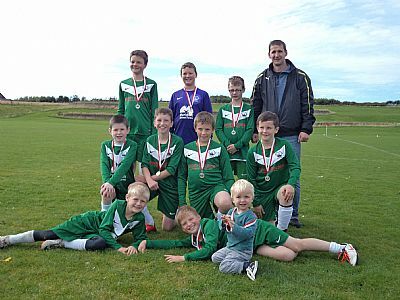 Thorfinn needed to win their final match by more than two goals and they duly obliged with a 5-0 victory. At the end of the matches OYDG Chairman Stephen Crawford congratulated all the teams on the quality of football played and thanked the Shetland clubs for making the trip and contributing to an exciting competition. He then presented winners medals to both the Thorfinn teams. OYDG would also like to thank the weekend’s referees – Graeme Leask, Jimmy Leask, Ian Scott and Charlie Alway. Results: East United C 0 East United B 3; Thorfinn B 4 Scalloway B 0; Thorfinn C 0 East United B 5; East United C 3 Rangers B 1; Thorfinn C 2 Thorfinn B 4; East United B 4 Rangers B 0; Scalloway B 1 East United C 2; Rangers B 1 Thorfinn B 7; Scalloway B 0 Thorfinn C 2; Rangers B 1 Scalloway B 3; Thorfinn C 4 East United C 1; Thorfinn B 1 East United B 1; East United B 4 Scalloway B 2; Thorfinn C 3 Rangers B 0; East United C 0 Thorfinn B 5. 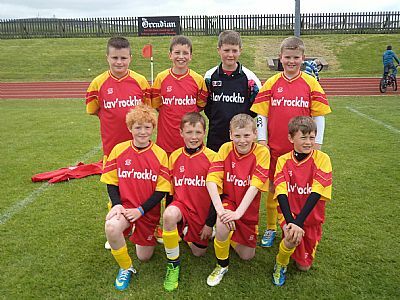 On Sunday August 25th the Orkney Under 13 squad participated in an Under 14’s 7-a-side competition against Shetland club sides with the boys split into an Orkney East and an Orkney West teams. Despite playing against older boys both teams performed well finishing third in their respective groups and finished up playing each other in the Plate final. 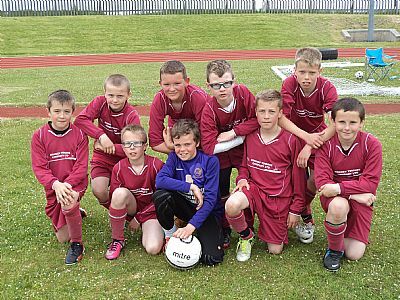 The bragging rights went to the West team who won 2-0 but the competition was overshadowed by the earlier injury to Ewan Scott in a game against one of Shetland clubs. Orkney Green 0 Shetland Blue 1; Orkney Wine 1 Shetland Sky Blue 0; Orkney Green 1 Shetland Sky Blue 0; Orkney Yellow 0 Shetland Blue 0; Shetland Blue 1 Shetland Sky Blue 2; Orkney Wine 4 Orkney Yellow 1; Orkney Yellow 2 Shetland Sky Blue 1; Orkney Wine 4 Orkney Green 1; Orkney Green 3 Orkney Yellow 1; Orkney Wine 0 Shetland Blue 0. 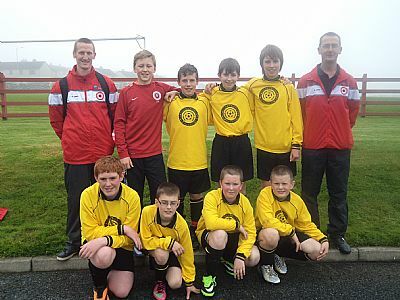 The 2013 Northern Counties tournament played on 8th June at Picky was further enhanced this year as Ross County entered teams in the competition for the first time. 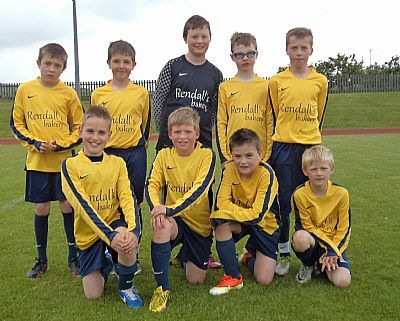 There was immediate success for the Dingwall team as they won the tournament at the first time of asking when they narrowly beat Shetland 2-1 in the final after an exciting day’s football with plenty of high quality action on display. The group stages saw Ross County Red convincingly win Group 1 with five wins from five matches. 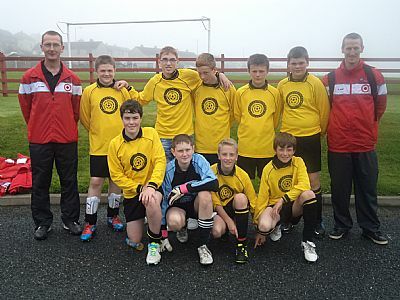 They were joined on the semis by ICT White who narrowly edged out Orkney Red by a single point. In Group 2 Ross County Blue edged out Shetland Blue by a single point to win the group. The semi-finals were extremely tight matches. 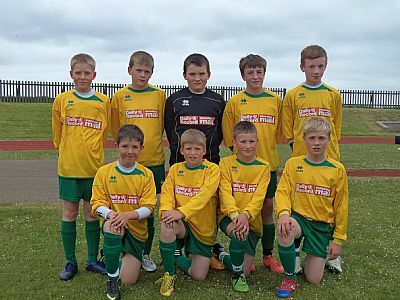 A late breakaway goal against the run of play by Shetland Blue ensured that an island team would take part in the final. The other semi-final between the Highland Premier rivals was even tighter with a penalty shoot out required to separate the teams with Ross County proving more clinical finishers. 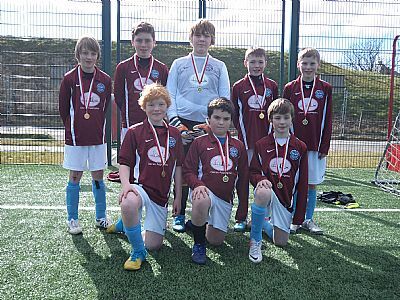 Shetland Blue fought back from a goal down in the final to equalise against Ross County but the Dingwall team always had the edge and scored a second half winner to defeat the Shetland side who will have been very pleased with their progress in the tournament. Following the final match OYDG Chairman Stephen Crawford congratulated the teams and thanked all those that had contributed to one of the top youth tournaments in North football. 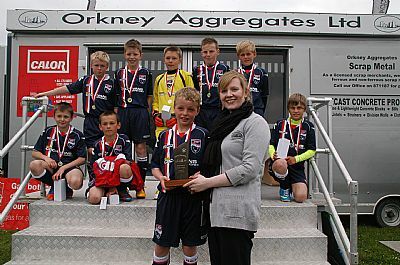 Susan Cruikshank from sponsors Orkney Aggregates then presented Ross County with their winners medals. This year saw the sponsors also provide a new trophy for the tournament. Reflecting the sponsors business it was highly appropriate that the new trophy is made out of Orkney flagstone. OYDG would like to thank Orkney Aggregates for their fantastic and continuing sponsorship of the Northern Counties. Orkney Yellow 3 Orkney Wine 1; Shetland Blue 1 ICT Blue 0; Caithness Red 0 Ross County Blue 3; ICT Blue 3 Orkney Yellow 2; Ross County Blue 5 Orkney Wine 0; Caithness Red 0 Shetland Blue 2; ICT Blue 1 Orkney Wine 2; Ross County Blue 1 Shetland Blue 0; Orkney Yellow 0 Caithness Red 1; Orkney Wine 0 Shetland Blue 1; Caithness Red 0 ICT Blue 1; Orkney Yellow 0 Ross County Blue 2; Orkney Wine 2 Caithness Red 2; ICT Blue 0 Ross County Blue 0; Shetland Blue 2 Orkney Yellow 0. 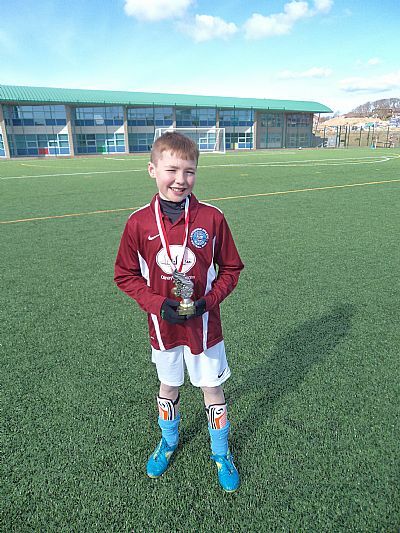 The youth outdoor football season kicked off on Saturday 30th March in perfect weather conditions at KGS with the Under 12’s club competition centred around the annual visit of the Whitedale club from Shetland. Nine clubs including two from Whitedale took part split into an A and a B league. The glorious sunny weather brought the best out of the players, and supporters were treated to a very exciting competition with both leagues going down to the result of the final match. Going into the final match three teams could have won the A League and with only 30 seconds left in the East United versus Thorfinn match the 0-0 draw was enough to have secured a league win for the Kirkwall side. However East Utd scored a late which worked to the benefit of Stromness A whose better goal difference just secured them victory over United. 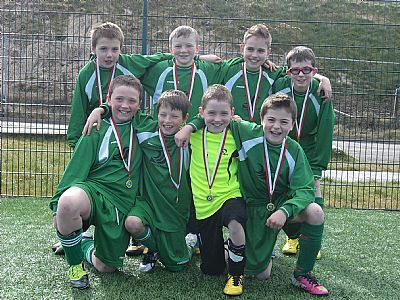 This was the second year in a row Stromness have won this competition and continued their excellent start to the year having already secured the Primary indoor football league. The B league also went to the final match between two Thorfinn sides. The B team needed a victory but the younger C team did very well to hold out for a draw and win the league by a single point. At the end of the competition OYDG Chairman Stephen Crawford thanked Whitedale for coming down for their annual trip and providing good competition in the curtain raiser to the new outdoor season. 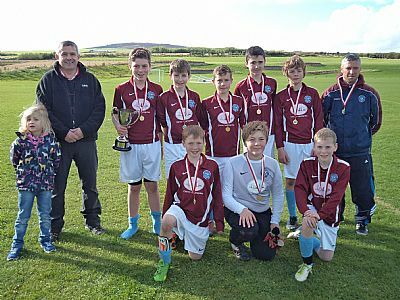 Commenting in particular on the closeness of both Leagues he congratulated all the teams on the high standard of football before presenting medals to the winning Stromness A and Thorfinn C teams. The Whitedale coaches also picked Callan Jessiman from Stromness A as the Orkney Player of the Tournament, and generously presented him with a trophy. OYDG would also like to thank the three referees for the day; Shane Stanger, Jimmy Leask and Graeme Leask.